Ryan Lochte’s lies about being robbed at gunpoint may be less sociopathic than you think. 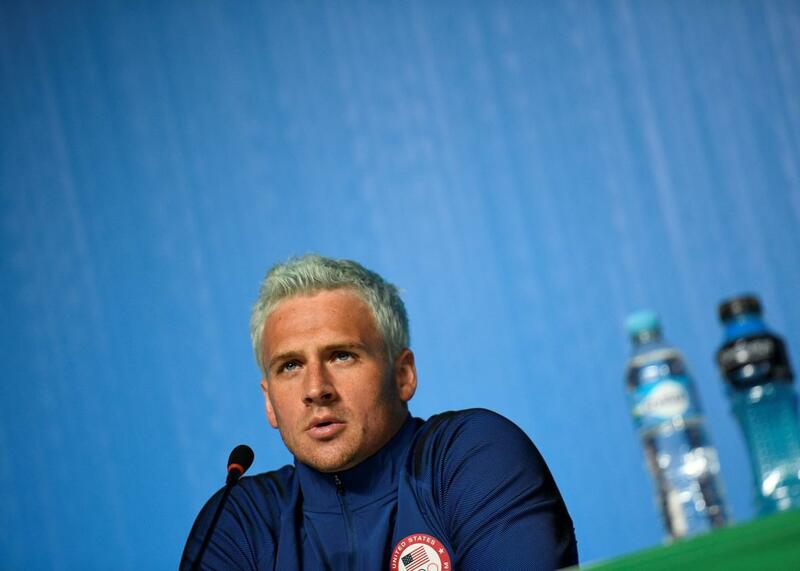 U.S. swimmer Ryan Lochte holds a press conference on Aug. 3 in Rio de Janeiro, two days ahead of the opening ceremony of the Rio 2016 Olympic Games. Over the weekend, U.S. Olympic swimmer Ryan Lochte claimed in a television interview that he and three teammates had been robbed at gunpoint after a night out in Rio de Janeiro. But in the intervening days, inconsistencies in Lochte’s story came out, and investigations into the matter by Brazilian police revealed the event almost certainly didn’t happen. The current theory: Lochte and his fellow swimmers vandalized the gas station, then fled after trying to pay $50 for damage they’d caused to a bathroom door. No one, it seems, was robbed. How could someone lie about something as serious as being robbed at gunpoint, and on television nonetheless? Is Lochte simply as oafish as many already suspect, or is there something more sinister lurking under his lies? When considering what motivates people to lie in the first place, Lochte’s fibs aren’t that out of the ordinary. Unsurprisingly, studies show we tend to lie more when the truth becomes difficult. The origin of Lochte’s lie was reportedly a story he told his mom about his night out—perhaps the robbed-at-gunpoint fib made it easier to explain why he got in late and had no cash. “Usually the reason people lie is because the truth is problematic in some way,” says Timothy Levine, distinguished professor and chairman of communications studies at the University of Alabama at Birmingham. That the fib originated with his family makes it pretty normal—lying to a loved one is quite common. “I actually think that the biggest reason why people lie in relationships is for self-presentation purposes,” says Dylan Selterman, a lecturer in the Department of Psychology at the University of Maryland. Unfortunately, Lochte’s mom retold his story to the press, so things sort of spiraled. But that’s probably not what Lochte intended. “This isn’t like a lot of the public lies we encounter that often seem more calculated,” says Levine. So if he told the original tall tale impulsively and for self-preservation, why did he continue to lie? There, the answer is pretty intuitive too: As Jonason puts it, “To backpedal would be to lose face.” Once his lie was out in the world, Lochte had to double-down. Unfortunately, that allegedly resulted in him reporting a false crime, which is a very big deal in Brazil and could have serious ramifications. Maybe most of us wouldn’t have taken a lie to the police or to the TV cameras, but most of us aren’t famous, either. In fact, that last bit might make Lochte slightly less typical and more prone to lying. Jonason’s research has covered what’s known as the “dark triad”—three sets of traits that may go along with a penchant for lying. Along with psychopathy and Machiavellianism, narcissism is one of these traits. And narcissism is not an entirely unexpected trait for the second-most-decorated U.S. Olympic swimmer of all time, who also happens to be a model.